In his interview Russian President told Novaya Gazeta about the country being free and full, the election in Sochi, the Yukos case, his non-affiliation with any party, web censorship, and the "rehabilitation of democracy". Novaya (Muratov): I would like to begin with more general questions, but there are some urgent ones. Maybe it is better to cancel the election in Sochi altogether rather than faking it? This simulation seems more cynical than cancellation. The court removed Lebedev from the candidates list and Nemtsov is not allowed to campaign. Medvedev: I don't know yet who was removed and how, but in any case there is a fully valid political fight going on in Sochi. And it is good that different political forces participate in it. In my opinion many municipal elections lack variety. People don't have anyone to choose from, they are bored. It is true that people usually choose politicians they understand, not famous celebrities, but the more interesting events like that we have, the better it will be for our election system, for democracy. As far specific circumstances - at every election there will be candidates who will lose, candidates who will be removed from the list, this is the way it goes everywhere in the world. But on a whole I think such campaigns are good for democracy. Novaya: On April 15 you will hold the President's Council, focusing on the issues of civil society and human rights. I was glad to see intelligent and honest people on the Council list - Auzan, Simonov, Svetlana Sorokina, Elena Panfilova, Yurgens, Irina Yasina, and there are more. Do I understand it correctly that today this civil society is more important for you than the society of government officials? Medvedev: You know civil society is a category that Russia doesn't have full understanding of yet. Everywhere in the world civil society is the flip-side of the state. The state is not just a political machine, it is a form of life organization based on state power and supported by law. Whereas civil society is a human dimension of any state. And even though it functions within the framework of legislation, it has its own human laws, which do not always appear in the official form. Not too long ago many people didn't even understand what was meant by "civil society". The state was a somewhat clear category. But what is civil society? A society of citizens? But we all are citizens of our country. But now there is already understanding that civil society is an essential social institution of any state. A feed-back. Institution. An organization of people that are outside official posts, but actively involved in the life of the country. And meetings, contacts between the country's President and representatives of this civil society are absolutely necessary. I would like to note that these contacts are never easy for any power. Because of civil society, human rights activists always have many complaints addressed to the state and its leaders. They have many questions. And we don't always want to answer questions. But that is exactly why these contacts should be regular. Including the Council that you mentioned. I expect to have an interesting discussion. Most likely, it will be tough. But that's why it is so valuable. Novaya: For several years there has been an unspoken contract between the state and the society (the majority of it, to be exact): the state keeps the society full and comfortable to an extent, and in return, the society stays loyal to the state and tolerant. 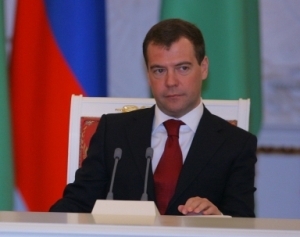 Medvedev: You mean the "democracy in exchange for prosperity", or "freedom for food" propositions? Novaya: Yes, and now when there is no more prosperity, what do you think this contract should look like? I will not even use the word "warming", it is more of a total "defrosting" of society. Neither society, nor the state can fight the crisis alone, they will be forced to talk. Medvedev: No doubt, the social contract is one of the best human ideas, and it played an important part in the development of democratic institutions in the world. We know the roots of Rousseau's idea, but if we are talking about the modern interpretation of the social contract idea, I would say that its construction is part of our Constitution. The Constitution itself is a special agreement between the state, on the one hand, and citizens of this state, on the other. Medvedev: On how to execute power in our state, our country. In this context, the social contract means that some powers that a person has, in accordance with the natural law, are transferred to the state, so that the state would provide for the person's prosperity, life, and freedoms. But I think we can never set a stable, good life against a list of political rights and freedoms. It is not right to set democracy against food. On the other hand, we do understand that intricate civil rights and freedoms can be threatened if society is unstable. If its basic wellbeing is not ensured. If people don't feel protected, if they don't get paid, if they are unable to buy basic foods, if their life is threatened. Therefore I don't see any contradiction in your question. It is obvious to me that this social contract has its roots not just in famous theories of 17-18th centuries, but also in our Constitution. Novaya: Do you suggest Russia should combine freedom and wellbeing? Novaya: The main function of society today is of course to control red tape. To control the services that this red tape provides to the society. How do you think this can be done? The whole country was reading the income declarations of your subordinates as well as the Prime Minister's subordinates. Medvedev: They all probably enjoyed the reading? Medvedev: It is one of the major objectives of any state to control red tape, government officials. The state must control its officials, who serve this state. And of course a whole range if different control procedures is involved. We started doing this already some time ago, and I can't report any huge success. However, if we compare today's situation with the 90s, I think things are much better today. Control systems at least have their legal procedures, and as someone with a legal mind I can tell you - procedures are very important. And their execution provides for law enforcement in the society as a whole, legal awareness, the level of legal nihilism that I have talked about many times, depends on it. That's why we have a significant number of procedures now. Some time ago we changed our legislation regulating state service. I myself began to work on that when I was still in the Presidential administration. We accepted a rather relevant, contemporary law about the basics of state service, accepted laws on different kinds of state service, and this work is still going on, there are a number of new things in this area. Also recently we accepted a whole package of anti-corruption laws and some changes into the state service legislation, including the part where it talks about declaring income, and other serious and useful things. In my opinion, the main problem now is not the absence of laws on control, but their diligent execution. Of course, that is the most difficult thing. Because when red tape is supposed to control itself, this is not a pleasant thing, I know. But we still need to make sure that these procedures are observed, even though nobody likes to control themselves, limit themselves. But this is what sets a civilized society apart - it has learned to do it. As far declaring goes - this is just one of control institutions. An important one, but not all inclusive. It is a very good thing that first time in Russia's history (this has never happened before - neither under Tsars, nor in Soviet times or in the recent history) all high-ranking officials did not just report to the tax office their income and incomes of their close relative, they made them known to the people. This is the habit that should be formed without causing any allergic reactions. I might get the following question - does this publication of declarations mean that we now control all high ranking officials and other government workers? Of course, not! But at least we took this first step in the right direction. And if a person declares his income year after year, and the high ranking officials, I repeat, do not just declare their income, but publish it, then at least this person has to think about the nature of his/her assets, and what means are used. I think that our officials are regular Russian citizens and they have a very important mission. Medvedev: Absolutely regular, just like everybody else. Novaya: Just with beacons on their vehicles. Medvedev: Not all of them. This is a common misconception. We have millions of state workers, and an insignificant number of them have the right to this type of transportation. So - by declaring and through other forms of control we create a chain of events which eventually will make up the person's history. Medvedev: Why not? They are regular people by all means. You mentioned wives for example. I think any person can decide for themselves how to organize their family life. And there is nothing special in the fact that officials' wives do business. The question is - how transparent is it? And also are there conflicting interests in this? If an official is involved in regulating processes in one field or another and their spouse works in a major company in this area, it is not ethical. But if this is some other business, then it is ok. That is how it is everywhere else in the world. There is no taboo on officials' spouses doing business. It is an issue of personal integrity and knowing the limits. And publicizing incomes of officials and their close relatives should create this culture. May be not right a way. And I will say it again, this will be some kind of history. History of a person as a leader and history of his family. This might not be pleasant, because you don't always want someone to discuss your spouse's income. But this is part of an official's public image. Every person has a choice! You can stay in business absolutely legally, but at the same time make money, not publishing any reports anywhere. Banking confidentiality should be guaranteed in Russia, just like in any other country. But you can make a different choice. You can become a state employee, an official, but in this case this person, especially if he thinks about the future and structures his career accordingly, has to understand that at some point he will have to uncover a part of his private life. It is a conscious choice, but those who decide to do so, must understand - it is inevitable. And this can make certain things uncomfortable for the family. Novaya: Have you personally felt the officials' negative reaction? Or did they have a good understanding of your decision to publish the declarations? Medvedev: You know my post of the President allows me to be exempt from listening to officials' negative reactions. I made the decision, and they all have to follow it. About courts and "Khodorkovsky - Lebedev case"
Novaya: Mr. Medvedev, from this "human judgment", when tax returns are made public and an official's "credit history" emerges, I would like to move to your favorite subject - courts and their independence. I want to ask about "the Yukos's second case". Could you foresee this case's outcome? Unfortunately, the outcome of the first one was obvious to all who were following the story. Is it obvious this time? I received the following letter - "At first Medvedev will just call most of the judges, including the Yukos case judge and tell them - you are independent, you are independent, I would like to remind you - you are independent, independent, independent!" This manual control in order to restore the judging institution. Medvedev: I can tell you that there are major downsides to any manual management. And I am not even talking about courts now. We need to move towards making sure that the state machine can work in a reasonable automatic regime. And now about courts and the specific case. I have a relatively short answer to that. May be for some the outcome of one case or another is predictable. It is the freedom and benefit of a person who doesn't have any state obligations, and is a free analyst, for example, who says: I think this is the way it will be. And then he will say - see, I told you, - or, - Sorry, I was wrong. But for a state official, and especially for the President, there is no such freedom to comment and never will be. Predictability of a court decision, court sentence is unlawful. This is a sign of breaking the law. As far as all other free commentators are concerned - it is their business. For state officials and the President there can be no predictability in any court case, including the one you mentioned. Novaya: Just now you basically repeated the famous saying from the 18th century, by emperor Fredrick. I'll quote using Mamardashvilly's lecture as the source. When Frederick wanted to take away the mill from the mill owner, the mill owner told him: "Mr. Emperor, besides you, we have judges in our country..." And, having left the mill owner alone, Fredrick ordered an inscription to be written there: "Mr. Emperor, besides you, we have judges in our country". Lucky mill owner, he had judges, besides the Emperor. Medvedev: There are other thoughts on this issue - Hume, for example, said: "The whole political system exists only in order for the judges to carry out their functions independently"
Novaya: Before we move on to the subject of charity, I would like to ask you. There has been rumours, are you going to join one of the political parties? May be even the ruling one? Medvedev: Just recently I was talking about it when I met with United Russia. And I told them that there is a tradition in our country that the President does not belong to any party. And at a certain stage this is the right thing - I have always thought so. Because our political system is underdeveloped. It needs to develop, needs to mature. It does not mean that we should never have the President belonging to a political party and say it is impossible to have that in our country.People belonging to political parties or leading political movements, become Presidents in other countries. We don't have it yet. The question is - when are we going to be ready for this? It is an issue of political experience. An issue of political life. Novaya: So there is a need to reform the elections system some time in the future, to have real competition between parties? Medvedev: I think that election legislation, legislation on parties and social unions is very flexible legislation. In my opinion, it needs to be changed regularly. This is how it is in other countries. And it is a normal process in our country. I would be a lot more careful when it comes down to changing civil laws, for example, which stipulates citizen's property, property rights in the country, conventional institutions, inheriting mechanisms, because these are fundamental things. Napoleon's Code was accepted 200 years ago. And it functions just fine, even though there are many outdated things in it. But with any changes, Constitutional fundamentals should never be questioned. Novaya: Recently - you might have seen it in blogs - the NGO Mothers of Beslan have shown discontent. The guardians and parents were taxed for the living and education expenses of their children in Korallovo college. [The college was established by Mikhail Khodorkovsky for orphans and children who suffered in terror acts and whose parents suffered as well. His parents work there.] The state does not spend money on that, but recovers taxes. And this is not the only case. When I pay for a sick child's treatment as a private citizen, I know: parents will have to pay 13% as a revenue tax. Those who receive this money from us, have collected it with difficulty to cure their child (there are many examples), they cry, but have to go and pay tax. It's probably reasonable to change the Charity Law? Medvedev: The Charity Law needs improvement. The problem is in details as usual. Of course there are obvious cases of acts of charity and helping sick children and elderly persons. But there are less evident cases, when people are tempted to use this money channel for commercial purposes. We need to learn (with the help of legislation) how to tell the money directed for charity from the money transferred to fulfill commercial tasks. Novaya: Making acts of kindness must be made easier. Suppose, you see a picture of a sick child in a newspaper, underneath there is a cell phone number, you dial - and the money is taken from your account. An act of kindness is absolutely available. But the telephone companies take an unthinkable per cent for this service, so the whole idea is spoilt. Medvedev: Bright idea! Everything is to be done fast. Also the possibility for an act of kindness needs to be equal for both the rich and the poor. Charity is important on both large and small scale (to stimulate it we have passed a law on creating trust funds) . Small scale charity is no less important. I always give this example: we are ashamed to donate 100 roubles for a sick children support fund or for the university where we studied. But why? Because we doubt whether 100 roubles is enough, they might think that you are kidding. But in other countries, it's not bad to send a dollar to the beloved university or to the municipality of your native town, because people think it normal behaviour And we are to encourage somehow important social undertakings. I think that it's right - to carry out acts of kindness regardless of income and the sum of the donation. Medvedev: It's a good idea. Military crimes are dangerous first of all because of their concealed character. The Military Prosecutor and investigator learn about very few cases, let alone the courts. But modern means of communication of course helps a lot. Novaya: We have recently written about the town of Maysky. You might have heard this story - it's connected with you. There was a rumour in Maysky town, in the Kabardino-Balkaria region, that President Medvedev will soon arrive to see his grandmother who lives there. What did the authorities do when they failed to find the granny? To be on the safe side they laid roads in the town. They removed tons of garbage, paved the town square, put street lamps up. The citizens are happy. I think we should spread a rumour about grannies of Medvedev, Surkov, members of Parliament in various towns - probably local authorities will wake from a trance due to fear. Internet and television. Freedom of speech. Novaya: The Internet is one of the few remaining public discussion forums. Do you think officials are trying to control the web? Medvedev: I don't think it's true. The Internet is not just one of a few forums, it's the best place for discussion. Today, there simply is nothing else as socially important, as active in its household presence and, at the same time, as suitable for direct communication. I've voiced my view of the Internet more than once, and I'll say it once again: we have to create normal conditions for the development of the internet in Russia. As an active and immersed internet user who accesses it daily, I think Russia needs a legal base for its development - meaning both laws and organization. Without organizational support, the internet will not be able to fully develop in our country. Recently, I've attended the launch of WiMAX [a telecommunications technology used in a variety of devices, from desktop PCs to mobile phones, providing high-speed Internet access with the use of IEEE 802.16 standard] in Armenia. Now, I envy my Armenian friends - it's a small country, and they've got WiMAX coverage everywhere, in every single place. You can drive across the country and watch TV in your car: you get a high-speed signal via wireless. In Russia, the situation is different: we are a very large country, and we had to spend a lot even to provide all schools with Internet access. It took a lot of organizational effort and state participation. I managed this programme personally. It's great that we now have internet access in all schools, it has also helped it to develop in smaller towns and villages which are a long way away from the country's center. As for legal regulation, it has to be sensible. We don't have to be light years ahead of the rest of the world: we just need to think about creating a legal environment which will not limit the internet's development, on the one hand, and block online crime, on the other. The internet shouldn't be viewed only as a potential criminal environment, more dangerous than other environments. The internet is not evil. Novaya: Outstanding Russian writer and analyst Dmitry Oreshkin once said the USSR couldn't create computers, because even copiers were controlled by the KGB. They would not let anyone have their own personal computer equipment. But it takes a special, free environment to modernize the country. You've mentioned elections, controlling bureaucracy, the internet. Does it mean that President Medvedev is set to rehabilitate democracy in Russia? Medvedev: You know, I think democracy itself doesn't need any rehabilitation. It's a historical notion, as well as a supranational one. That's why democracy doesn't need rehabilitation anywhere. There's also one other issue. Russians have come to associate the basic institutions of democracy with the very complicated political and, what's more important, economic processes that went on in the 1990s. Hence the perception of the term. But this has more to do with personal experience than the overall attitude to democracy. That's why I don't think we need to rehabilitate it. There was, there is and there will be democracy. Novaya: I've recently watched Andrey Khrzhanovsky's film on Brodsky, there was that wonderful quote: `Inhumanity is always the easiest thing to organize in Russia'. In fact, inhumanity is always easy, while justice and freedom are difficult. I wish you luck on your difficult journey.